Merry and Bright! : Der Bingle's Essentials: Ella Fitzgerald "Ella Wishes You a Swinging Christmas"
Der Bingle's Essentials: Ella Fitzgerald "Ella Wishes You a Swinging Christmas"
Ah, Ella Fitzgerald. I'm sure all of you are familiar with Ella Fitzgerald. If for no other reason (for those of us of a certain age) than her iconic commercials for Memorex in the 1970's. (Ok, maybe "iconic" is a stretch). I will admit, though, that those "Is it live or is it Memorex?" commercials are the first memories I have of Ms. Ella. "Ella wishes you a swinging Christmas" is a nearly perfect Christmas record containing 12 standards, opening with a rousing "Jingle Bells" and closing with "White Christmas". Superb musicians accompany Ella, with stellar arrangements. Her versions of "Sleigh Ride" and "Rudolph, The Red-Nosed Reindeer" have become quasi-standards in their own right. "Sleigh Ride" is particularly wonderful because its pace is slower than one might expect, but even at a more relaxed tempo there is an energy throughout the song. It makes you feel like you're out on a pleasant sleigh ride through the snowy countryside. My copy of the CD is a Verve release, but contains the original 1960 tracks. A later Verve release included six additional tracks (I just might need to snag me a copy of it). 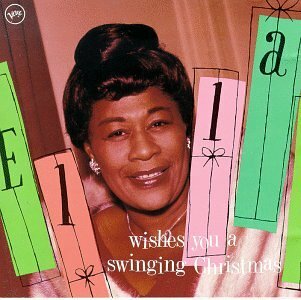 Truly Essential: "Ella wishes you a swinging Christmas"
That *is* one fine record. My "Ella" moment came when she played a local college. Snowy roads kept her drummer from reaching the place, and a local fellow (who played in a jazz trio) got a last-minute call to sit in. And I mean *last minute*. Nick Diehm got cues and coaching from the pianist and bassist, and sounded as if he'd been part of the trio for years.Ella name-checked him several times during the show.